Be More. Become BBB Accredited. Better Business Bureau Serving New Mexico and Southwest Colorado. Build Your Business With Trust. Help us personalize this page for you. No thanks, just let me see the page. Request a FREE consultation today to learn how BBB Accreditation adds visibility to your brand. This form is to request business accreditation information. It is NOT to file a consumer complaint. If you are a consumer, and need to file a complaint against a BBB-accredited business, please click here. in New Mexico and Southwest Colorado in the last 12 months? Results updated daily to show traffic over the last 12 months. BBB provides several resources and tools to help businesses Be More in order to meet consumer expectations. Consumers will be able to request a quote from BBB Accredited Businesses directly from their BBB Business Profile page. 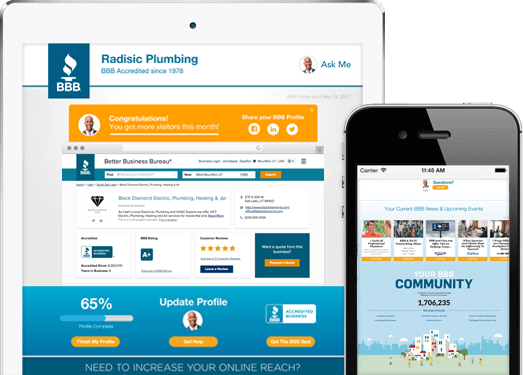 This customizable tool allows BBB Accredited Businesses the ability to showcase their products, services, and track record in the marketplace. We invite you to Be More with BBB Accreditation. "What the BBB stands for; what Vera Bradley stands for - it just aligns. Trust for us is one of our core values." "Anyone can say they're a contractor. But with BBB Accreditation and an A plus rating, people can see that we've stood the test of time and have done well for our clients." "Not only does BBB make a difference in our area, they really make a difference in all areas of our great nation. They've really got a finger on the pulse of businesses across the country."